The ramblings and rantings of a woman trying to hold onto what's left of her sanity. The name fits her perfectly and if you’re at all familiar with A. A. Milne’s, “The House at Pooh Corner”character, of the same name, you understand why. 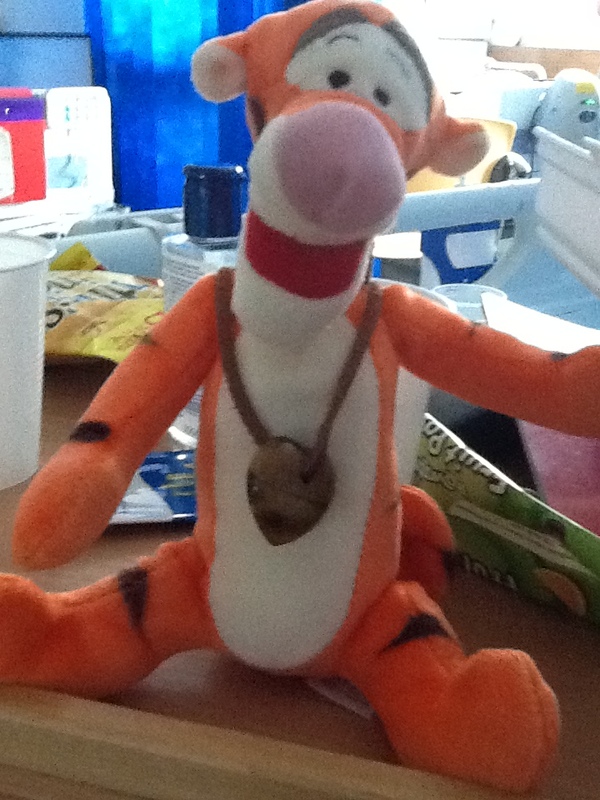 Like the fictional character, my Tigger is usually cheerful, outgoing, competitive and gives off a sense of confidence. Also like the other Tigger, Arielle is filled with optimism, has a bit of an ego, and can be very mischievous! Her actions have sometimes led to chaos or trouble and she has undertaken tasks with lots of gusto, only to realize they were perhaps not as easy as she had originally imagined. Milne’s Tigger boasts about never getting lost; and my Tigger has very successfully navigated her way though this world for 31 years, being hit with some serious detours and roadblocks, but has never been really lost. This week’s 5 consecutive days of chemo have sucked the bounce right out of her. And rightfully so… I’ve noticed, in comparison, most of the woman on the ward are receiving chemo one day a week or once every 10 days. Some are receiving injections versus the 6-9 hour drips. Taking this into consideration, she is doing AMAZINGLY well. …but the bounce is temporarily gone. As her Mom, seeing this happening, I find it quite sad and somewhat disheartening… but I have to remind myself that this too shall pass. I can’t imagine Milne’s Tigger letting something as sucky as cancer, permanently take his bounce away, nor will it take Arielle’s bounce away. She’ll be back with a bigger zest for life and a much higher bounce! You just wait and see. We are wishing Arielle the best. Thanks. I really appreciate your well wishes.